It can have a felt tip or a brush end. It can give a very fine and precise application, but that great power comes with the great responsibility of a firmer hand. The newbies can get pretty scared of using this one, and I personally don’t usually gravitate towards this kind of eyeliner too, but it delivers a beautiful, classical line and wing. I save it for those glamour days, when I have more time to work on it. This is a household favourite. It can be applied with a fine angled brush or with a fine liner brush. It gives you more control and more time to correct your mistakes. It is usually really intensely pigmented, and it can provide a bold statement thin or thick line, pitch black. It is usually waterproof or at least water resistant, so it doesn’t budge once it’s set, and it’s great to apply to your waterline. #TIP: to make it last longer on the waterline: apply once, let it set, and then go back and apply a second coat. if you have teary eyes like me, it does make a difference. The only problem, for me, is that if you’re not a power user, it can dry out and harden, becoming a waste of money… Keep that lid tight. My favourite budget one is the Maybelline New York Eyestudio Lasting Drama Gel Eyeliner 24h (talk about mouthfuls). It has the perfect texture and really black pigment. Also on the cheaper side, I’m pretty pleased with the Kiko Lasting Gel Eyeliner – it has a more runny texture, almost like acrylic paint, but it’s not necessarily bad, just different. It makes it pretty easy to manoeuvre, it’s a good thick black, I think it’ll last longer in the pot without drying out, and once it sets, it’s not going anywhere. For the high end side of things, the classics: MAC Fluidline, Clinique Brush-On Cream Liner, and the fabulous Bobbi Brown Long Wear Gel Eyeliner. Another classic, but with a twist. The ones I’m talking about are basically gel liners in pencil form. I’m not talking about those hard scratchy pencils, nor those messy kohl ones that create panda eyes in 5 minutes. I’m talking science doing magic. All the richness, softness and pigment of a gel pot, and the convenience of a pencil. They’re a cream dream to glide on the lids. Yet, once set, they don’t smudge. 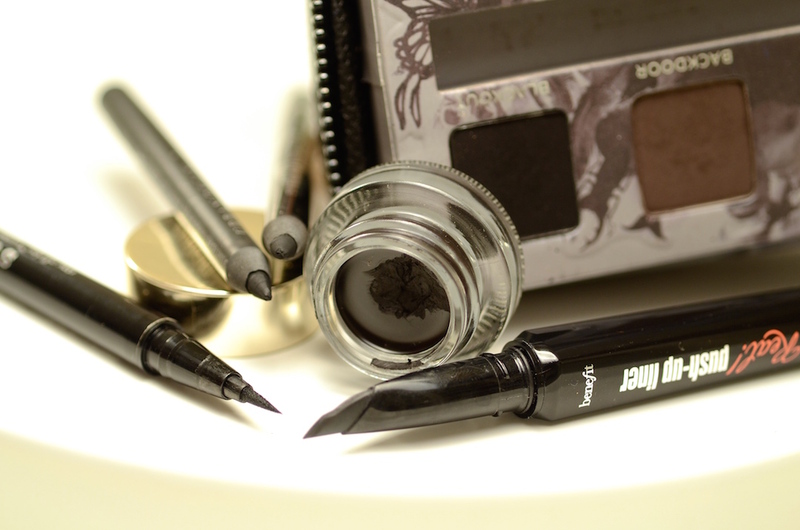 They’re so handy to use on the waterline, and if you’re a fan of a thicker or smudged line in a minute, this is the way to go. If you want a thinner line, just dab your angle or fine liner brush on the pencil and use the brush to create a more precise line. You can also do it by keeping the pencil sharpened at all times, but for me… it’s a waste of product. These babies also dry out, but way slower. I’ve used up tons of pencil liners, but never got to the end of a pot. Two absolute winners in my book, a financial world apart: Rimmel Scandaleyes Waterproof Khol Kajal Eyeliner, and, on the higher end, Urban Decay 24/7 Glide On Eye Pencil. It’s expensive, but it’s absolutely amazing for power users who like that quick punch of jet back. You can use it with an angled brush to create a soft smoky line. And you can use it over the eyeliner to lock in place and make it even more long-lasting. Just pack it on, without dragging, over the line. Or use it on its own, making soft upper strokes to create a more blurred out effect. Set your elbow on the table, and hold your hand against your face to get it more steady. Look just slightly down on the mirror. Gently pull the skin of the eye to smooth it out. I like starting from the middle area of my lash line and bring it outwards with small strokes, and then bring it from the centre to the inner corner of the eye. But you have to find what is most comfortable for *you*. I like to start with a thin line, as close to the lashes as possible, and then decide how thick I want it to be, and where: making a round eye with a thicker line more in the centre, or making it more cat-like, thicker all the way to the outer corner. If you’re not used to doing it, or your hand is just not that steady, resist the urge to draw a line all along the lashes: go with little strokes. Or even dots – and then connect the dots! Once in a while, look straight into the mirror to confirm if you’ve reached the desired thickness for your line. As to the feared flick – I must confess that I like to line my eyes without a flick, most of the time. But when I’m in the mood, and with plenty cotton buds at hand, I mark a little dot where I want the flick to end (a middle point, as far from the eye as you want, that follows the imaginary line of your lower lash line toward your brow), bring the eyeliner from the lower part of the line (corner of the eye) to that point, and then bring it from the point to the top area of the eyeliner – creating kind of a mini triangle. Then, I just fill it in. When taking it to the other eye, keep comparing both, looking straight into the mirror, so that the lines get as symmetrical as possible. Made a mistake? Use a cotton bud with a little bit of moisturiser (great for sensitive skin that gets very red) or makeup remover. It’s your first try? Don’t rush. Choose a moment in your life when you have the time to be focused and enjoy the thing. It’s not rocket science and *everyone* has a bad eyeliner day when the sucker just won’t come out straight. Have fun instead of freaking out. You can always clean things up afterwards with a bit of concealer. I have just went through your tutorial for applying the eyeliner, and I am SO practising it later today!! It is genious, and watching you do it makes it look fairly simple (I know my hand is not nearly as steady as yours, but you’re right, I just have to practise! ).